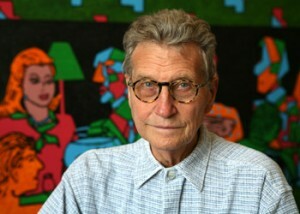 Derek Boshier first came to prominence with his paintings as a student at the Royal College of Art in London in the early 1960s, with fellow students David Hockney, Allen Jones, R.B. Kitaj, and others in the British Pop Art movement. In 1962 he was featured with Peter Blake, Pauline Boty and Peter Phillips in Ken Russell’s BBC documentary ‘Pop Goes The Easel’. During the 1970s Boshier experimented with different media, producing photographs, films, collages, constructions, books, posters and record covers.